Throwing a kids’ party in spring time means the options are endless when choosing a theme, venue, and entertainment. We have plenty of local kids’ vendors that will create an unforgettable experience at your child’s party. For stress-free event booking, browse our vendors, request free quotes, compare, and hire! We’ll take care of the rest. Read reviews to see who’s the best fit for your kid’s party and feel secure booking through our site, knowing you’re covered by the GigMasters Guarantee. Additionally, you can also look vendors with a “Background Verified” badge on their profile. This means that they have completed a comprehensive background check. 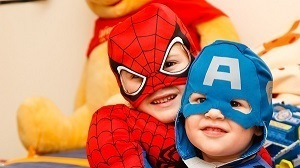 Booking a costumed character is the ultimate way to bring joy to your little one. They turn an average gettogether into a magical party. Imagine the sheer happiness your child will feel as they watch their favorite character come to life. Speak with your vendor ahead of time about any special requests you might have for them, such as: sitting for photos or opening presents. We don’t mean to namedrop, but Elmo, Spongebob, Moana and Spiderman are only a glimpse at who can make a special appearance. Your party doesn’t have to be theme-specific in order to invite a special costumed guest; but if you need a particular superhero or princess, you can be sure to find them here! Kids love an excuse to get a little paint on them! When a child gets a face painting, they are great at sitting patiently still, because they’re so excited for the reveal at the end! Whatever your kids dream of, our face painters can create it. 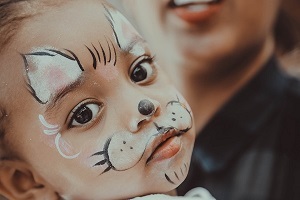 Face painters have the ability to transform your child into their favorite animal or creature, or just a simple work of art. Many of these artists offer services beyond traditional face paint, such as: glitter, henna, and airbrush tattoos. Hire one of our professionals to make your kid’s party extra colorful. Do you believe in magic? With our performers, your kids surely will. Our magicians have the ability to bring laugher and astonishment to their audience. They can work the whole room with their magic, and entertain more than just the kids. 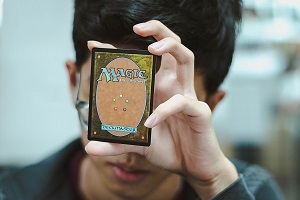 Magicians come in a variety of styles, so you can hand-pick which would be most suitable for your crowd. 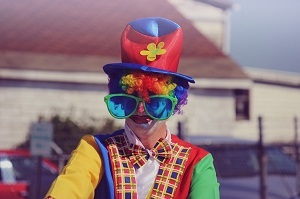 Clowns make the perfect entertainment for kids’ parties! Their friendly faces create a fun and happy atmosphere that the kids love to take part in. 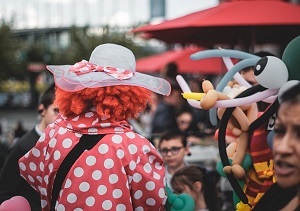 Many of our clowns provide inclusive games, captivating storytelling, puppetry and dancing, so the fun is limitless! Put an exciting twist on your next party by booking a balloon twister. Balloon twisting is a kids’ party classic, but balloon artists' skills have greatly evolved since the talent was first popularized. These vendors can sculpt balloons into hundreds of options such as: dinosaurs, aliens, cars, animals, and your kid’s favorite movie characters like Nemo or Minions. Many balloon twisters take the amusement up a notch by incorporating LED lights into their creations. You won’t regret having a balloon twister at your next kids’ event, as they will inflate the room with joy. We can't wait to hear about your event. Make sure to share your story with us, and tag us on social (@gigmasters)! We'd love to share your story.